Heckler: Dude, give it a rest. There was no 9-11 conspiracy! Demonstrator (holding sign that says "9-11 conspiracy"): Didn't more than one person make an agreement to commit a crime, i.e., fly those planes into WTC? 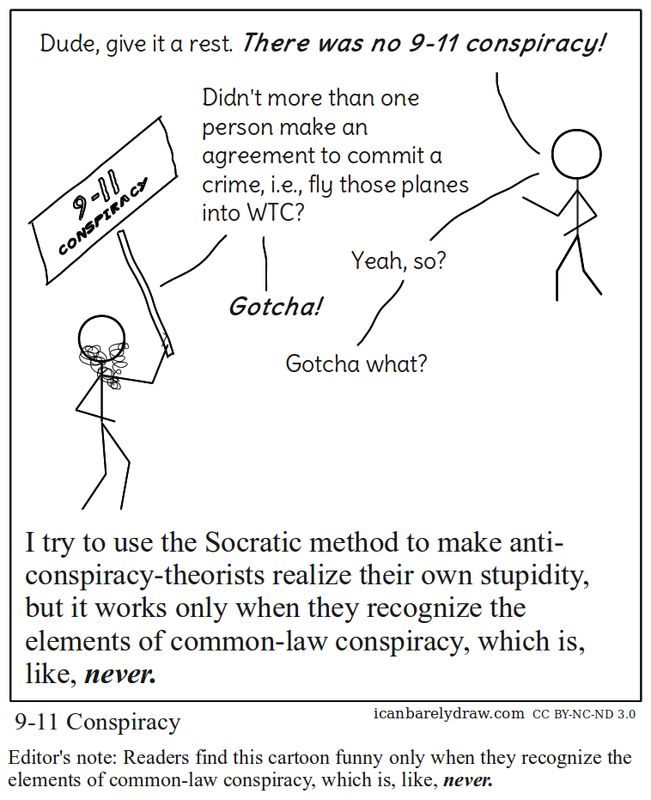 Subtitle text: I try to use the Socratic method to make anti-conspiracy-theorists realize their own stupidity, but it works only when they recognize the elements of common-law conspiracy, which is, like, never. Below-title text: Editor's note: Readers find this cartoon funny only when they recognize the elements of common-law conspiracy, which is, like, never.